The DreamStation Go Auto Travel CPAP machine by Philips Respironics is a portable version of their popular DreamStation machines. The DreamStation Go is half the size of the other DreamStation machines and includes many travel-friendly features and options such as a USB charging port, battery capability, and micro tubing. Philips Respironics brings the revolutionary travel design of the DreamStation Go to a fixed pressure CPAP machine, taking fixed pressure CPAP therapy to a new level. 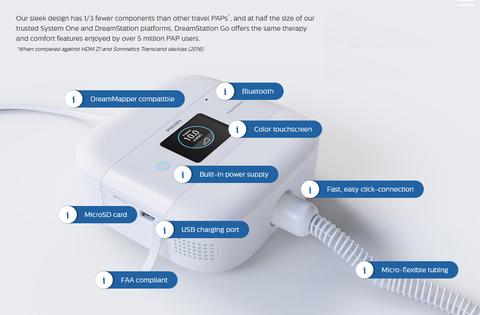 At half the size and two thirds less parts of the standard DreamStation platform, the DreamStation Go offers the same therapy, connectivity and comfort features used by over 5 million CPAP users. This innovative, state of the art design is not only truly portable but built to last. The Go flies through security just like a smartphone. Place it into the optional clamshell case to insure a safe transport. Click the button below to add the DreamStation Go Auto Travel CPAP Machine to your wish list.